The Pike/Wayne Conservation Partnership meets annually with legislators to discuss issues of concern. 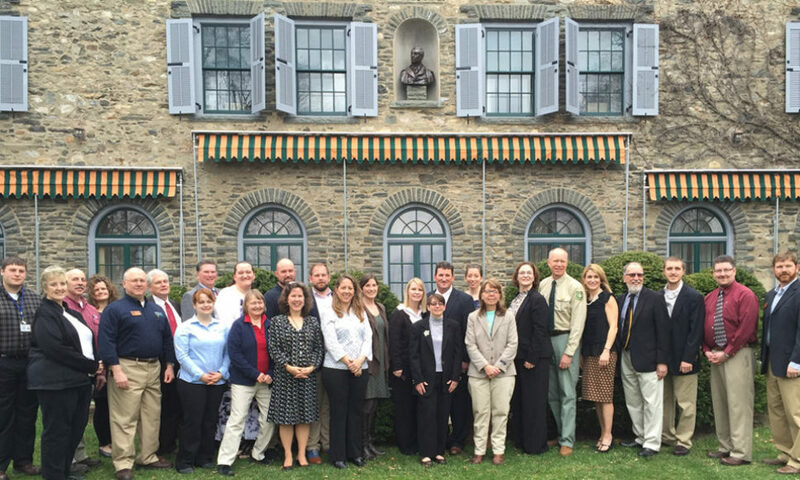 On April 1, 2016 Partners met with Legislators at the Grey Towers National Historic Site in Milford, PA for an informal breakfast and poster session. This year’s discussion focused on the importance of the natural resources to our local economy as well as some exciting projects the Partners are currently working on to protect these resources. Partners discussed how our conservation community is promoting the use of alternative energies, sharing resources to educate our residents and visitors on the importance of our resources, and securing funding to protect the water and forested resources that support our community’s economic engine. PCCD Administrative Manger Michele Ulmer worked with Partners throughout the spring to put together the event. PCCD Executive Director Sally Corrigan and Watershed Specialist Emily Rinaldi spoke with Legislators about the District’s surface and groundwater monitoring programs. These programs are critical to providing baseline information on the quality and quantity of water resources. Our water resources are essential to not only the quality of life enjoyed by both residents and visitors to Pike County but also the economy of our region. The water monitoring programs are supported through grants provided through the Growing Greener Initiatives and the Commonwealth Finance Authority (CFA) Marcellus Legacy Fund Baseline Water Quality Program. Over $369,000 from these sources has been provided in grants for groundwater monitoring in Pike County since 2007. These programs are also supported by the Pike County Commissioners by providing over $190,560 in grant funding from the Pike County Scenic Rural Character Preservation Program.